At this point, my summer research as a Wrigley Fellow has basically wrapped up. I’ve been off the island for the past couple of weeks because I was presenting my research at the Goldschmidt conference, an international meeting of geochemists that was held in Paris this year. I told them about a new method for measuring a particular chemical form of iron, and then talked about how I’d used that method in Big Fisherman’s Cove at Catalina. Basically, I’ve been able to show that when you have direct sunlight hitting dust particles in the water, it can cause individual atoms of iron to break free and float off as a dissolved compound, which could then be assimilated by algae or other marine organisms. This process probably matters a lot farther offshore, where organisms are starved for iron and the only source of iron is dust particles that would rapidly sink otherwise. 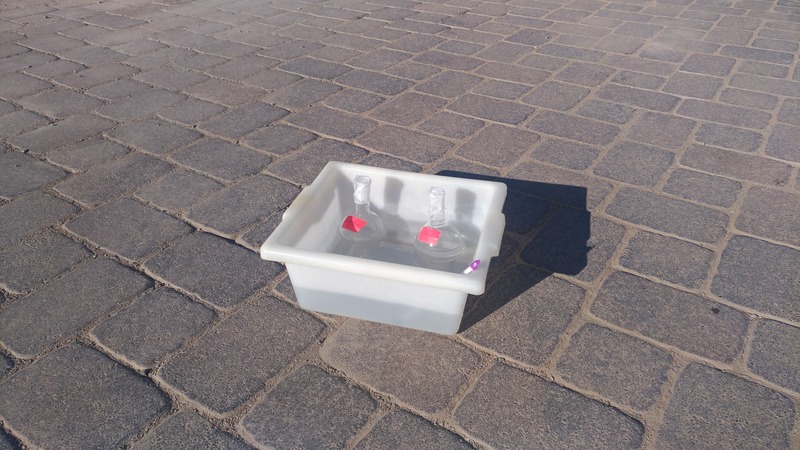 Quartz flasks of seawater exposed to direct sunlight let me test hypotheses about how mineral particles break down. Now that the classes have started again, I can’t spend as much time on Catalina as I would like. I’m still going out to do some work, including experiments like the one above, where I’m exposing seawater treated in different ways to sunlight and trying to figure out exactly how particles break down. I’ll also be out there for some work with Yubin Raut, another Wrigley Fellow who’s trying to study how rotting macroalgae affects the chemistry of the water around them. Me, in front of an ESI seaFAST automated preconcentration system. 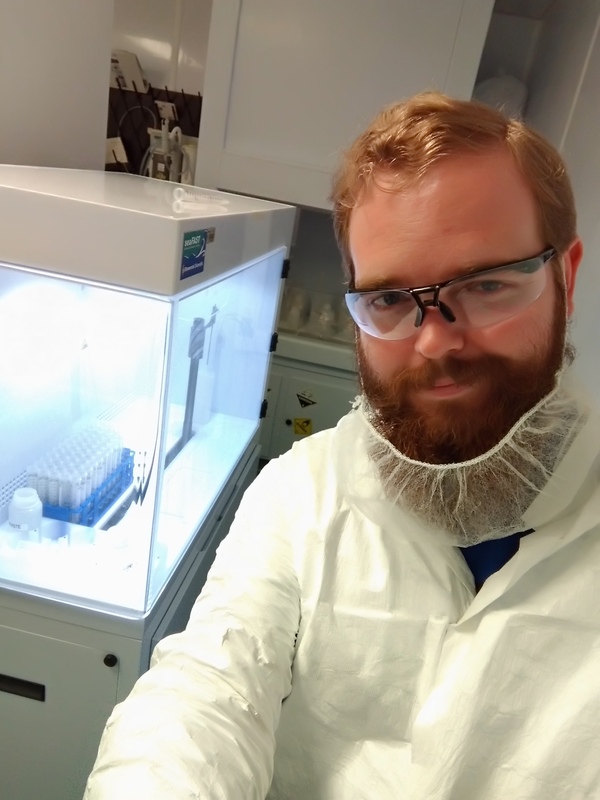 The beard cover is to reduce the chances of getting hair in a sample. Instead, most of what I’m doing these days is lab work. Over the past summer, I’ve collected a whole bunch of samples of seawater, as well as particles, and now I need to measure the iron concentrations of them. 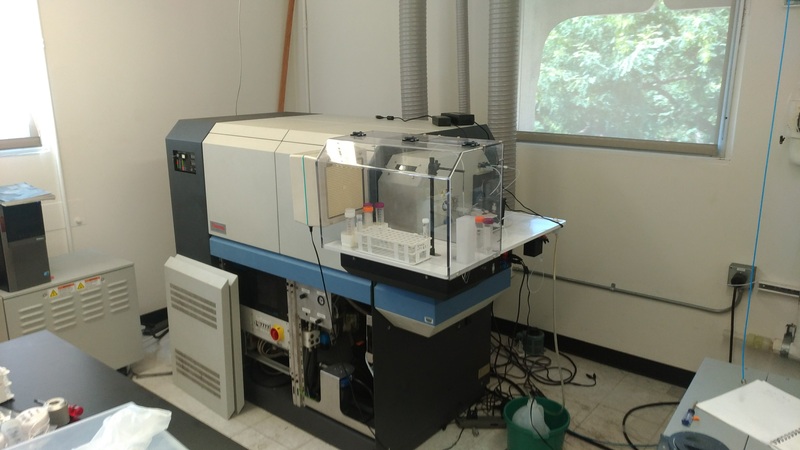 So when I’m not on the island, and not in a class, I’m running those samples through the device in the picture above, which will concentrate the iron in a sample. The vials that come out of the seaFAST then get put into an Inductively Coupled Plasma Mass Spectrometer (below). The ICP-MS works by putting the sample into a plasma torch (something non-scientists would call a lightsaber) and then measuring the individual atoms as they go flying off. It’s a very powerful instrument, but like most high-end scientific equipment, it’s finicky enough that we frequently have to open it up and make repairs. That, plus a little bit more lab work on the island, is going to be plenty to keep me busy this fall. The ICP-MS is sort of my research group’s workhorse. It’s large enough and sensitive enough that I can’t really bring it to Catalina with me. This entry was posted in Graduate, Wrigley Institute on September 12, 2017 by Jessica Dutton. Hi, my name is Alexis Estrada and I am a graduate student in Dr. Mark Steele’s lab at California State University, Northridge where I conduct field based research in marine ecology. The ecology of marine environments is most interesting to me because the dynamic landscape of the habitats that marine environments encompass, the specific interactions of organisms living in this environment, and how marine environments are being impacted by humans. My research interests are centered around understanding how marine populations respond to and recover from human mediated impacts such as overfishing and a changing habitat and how this understanding can better inform management efforts. As a Wrigley Institute Fellow, I am examining factors that could be affecting the population structure and recovery of the green abalone population at Santa Catalina Island, a species that was once prominent on coastal rocky reefs throughout southern California and important in both commercial and recreational fisheries. Data on green abalone densities and their habitat are limited, making it difficult to assess whether this species is recovering 20 years after a closure of all commercial and recreational abalone fishing south of San Francisco. Moreover, there is little published data on the specific habitat of green abalone, which hampers monitoring and management of this species. An increasing abundance of green abalone at Santa Catalina Island has provided a unique opportunity to examine the basic ecology of green abalone. A large part of my research is focused on understanding how green abalone interact with this variable environment. Green abalone inhabit temperate rocky reefs and are generally found in shallow water (low intertidal to 27 ft and sometimes as deep as 60 ft). Reef habitat however, can be highly variable at different depths and from site to site. Rocky reef environments can have dramatically different physical characteristics and algal communities which may impact green abalone abundance. My density and habitat study seeks to determine the key habitats for green abalone by recording habitat data and green abalone density to see if there is a predictive relationship between habitat and abalone abundance. To do this, I have been conducting SCUBA surveys around Santa Catalina Island to quantify how these habitat features impact abalone density. I use transect tape (measuring tape) to mark out my survey areas. For each site, I survey 3 transect areas (30 m long x 2 m wide) at each of several depths (2-4, 6-8, 10-12, 16-18 m). 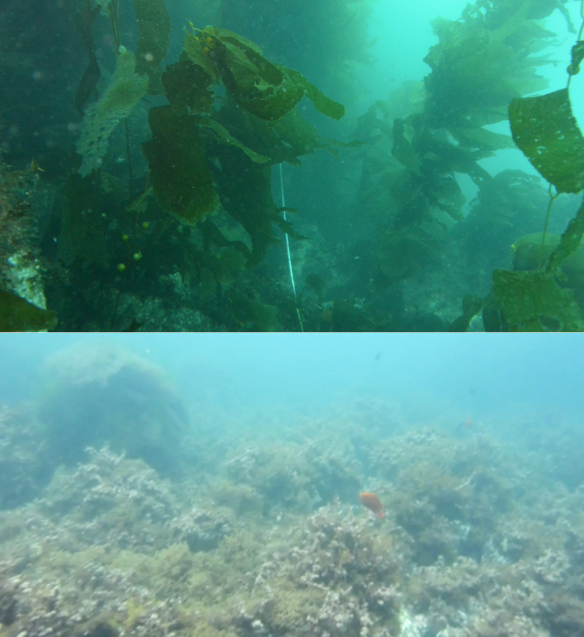 On each of these transects I count abalone and measure the following habitat features: depth, algal abundance, rocky structure, height of substrate, and reef slope. So far, I have found that green abalone densities are greatest at shallow sites (2-4 m) and decrease with depth. In the 2-4 m zone, the presence of green abalone averaged 0.138 abalone per square meter (8.3 abalone per transect). 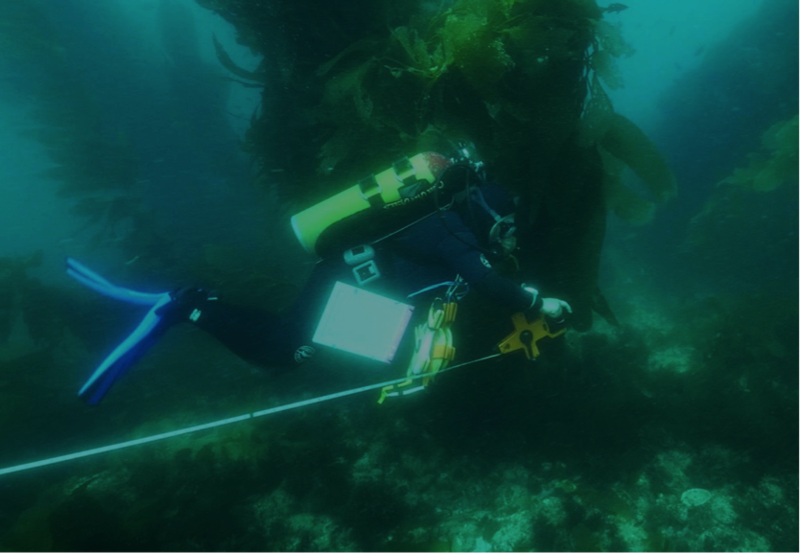 While green abalone have been recorded at the deepest 16-18 m depths in my study, it is very rare for them to be that deep at Santa Catalina Island. Green abalone are found on rocky reefs with decreasing reef incline (degree angle of the slope of the rocky reef), decreasing abundance of sand, and decreasing abundance of cobble. 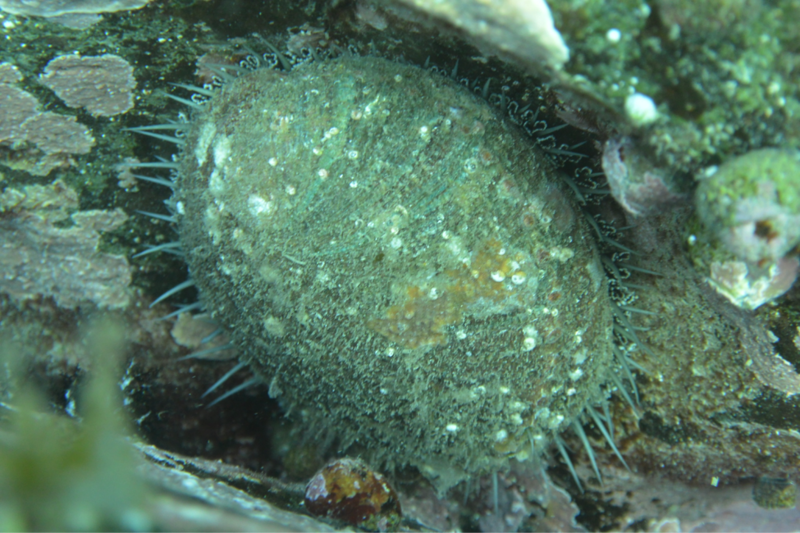 Several species of algae proved to predict green abalone density. Green abalone density decreases in areas dominated by large amounts of benchrock. 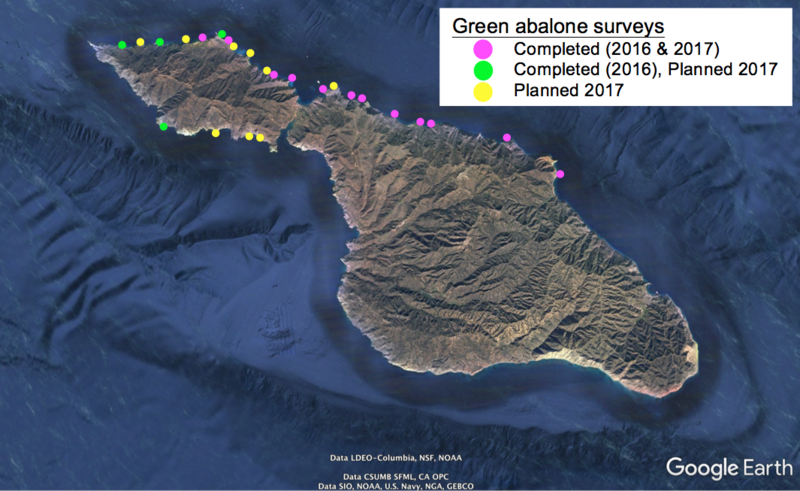 Understanding key habitats for green at Catalina will help monitoring efforts by allowing surveys to be focused on the depths and habitats in which the highest densities of green abalone are found. This allows for cost-effective assessment of green abalone populations in southern California, allowing us to gauge how widespread the recovery from overfishing as been. As always, stay tuned for more exciting research with green abalone! This entry was posted in Wrigley Institute on September 7, 2017 by Jessica Dutton.